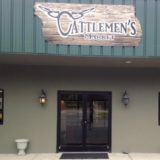 Cattlemen's Market is the new home of Buffalo Creek Beef and Donald's Meats, plus a wide variety of other local and regional wares. We offer a deli case, soup specials, take-and-bake pastas, daily lunch specials, eggs, Homestead Creamery milk, Route 11 Potato Chips, and more. Open Monday through Friday 9 a.m. to 6 p.m. and 9 a.m. to 4 p.m. Saturday.